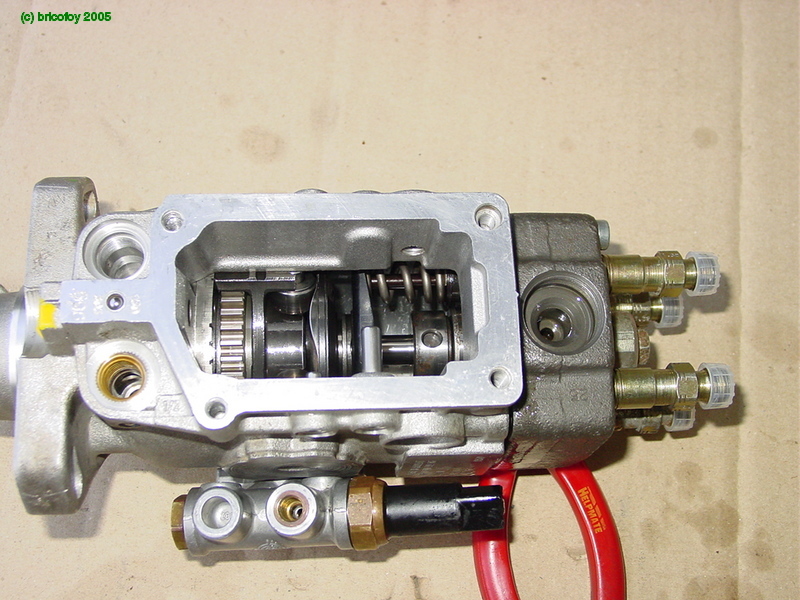 On an Oka, there is only one critical electrical item which keeps the engine running or not, and that's the fuel cut off solenoid at the back of the injector pump. (Bosch call it the ELAB, electronic shut off device. This Bosch Instruction Manual is a very valuable resource on the VE pump). As long as you can start the engine (maybe by bump starting it if you have no battery power or the starter has failed), that solenoid wire with 12v applied is the only electrical thing needed to keep it running and a even small 6v lantern battery would probably do. Even if all dashboard "ignition" functions are disabled, connecting up the fuel cut off solenoid to 12v and hot wiring the starter motor to the battery (or batteries) should start the engine (in neutral of course with the park brake on since you'll be under the vehicle). The key is still required to unlock the steering though. Connect the Start Relay connection on the starter relay body (a small terminal between 2 large ones) to the battery +ve to engage the starter gear (only a thin wire is required), and remove it when the engine starts. (One of the large terminals will be a battery +ve connection so only a short wire is needed, even a screwdriver would work). If there's only a click, or nothing at all, the battery wiring is suspect so you may also need to use a thick jumper lead to connect the battery +ve to the main starter motor terminal (which is probably on the starter relay body, not the actual starter motor, follow the (red) wiring from the battery), but it should already be connected. 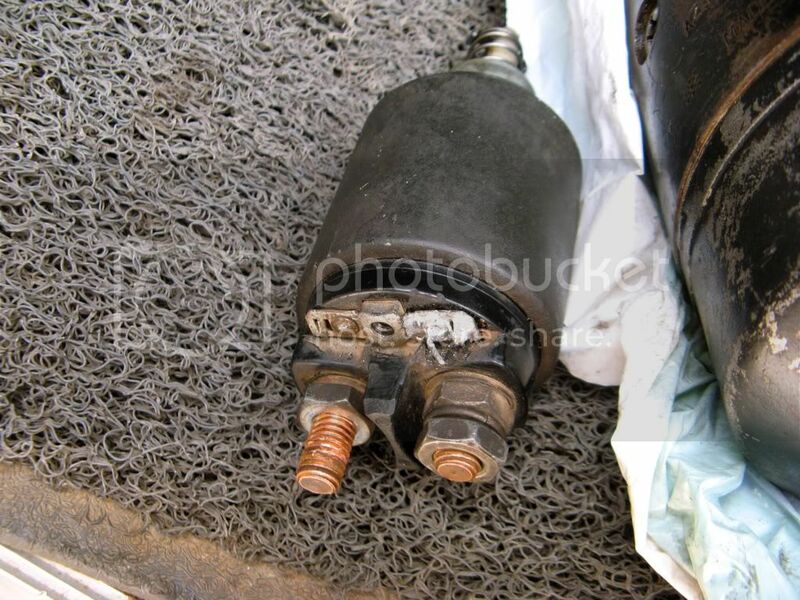 The lead on our starter motor body is actually a (black) ground connection. Also check that the battery -ve is effectively connected to the chassis or frame of the starter motor using the other jumper lead. Disconnecting the fuel cut off lead will stop the engine (or it can be stalled in a high gear by gently letting out the clutch with the brakes on). If the engine rotates but doesn't start, it's a fuel problem (or less likely, a major mechanical fault) and that could be the solenoid. But it could also be the lift pump, or you could be out of fuel, or have air or a blockage in the system so check out these and all other possibilities before accusing the solenoid. What if the starter fails? Another obscure fault we have had is an intermittent winding connection inside the starter solenoid on top of the starter motor body. This can prevent starting on an otherwise healthy vehicle and are not repairable items so a spare would be a wise investment (about $100). 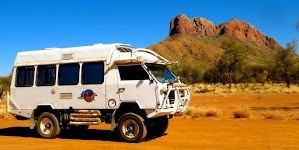 Pity we didn't have one when ours failed, we had to have one shipped from Perth to Eucla. The solenoid with the dodgy connection, after I reflowed the solder to try and fix it. ensure the gears are in neutral and connect the starter motor connection to the battery +ve manually, using the internal solenoid contactor (and pressing in the internal plunger to bridge the contacts), a high current (300A+) relay (like the one for paralleling dual batteries) or or even a thick jumper lead. Connecting batteries in parallel will help to drive the starter motor. 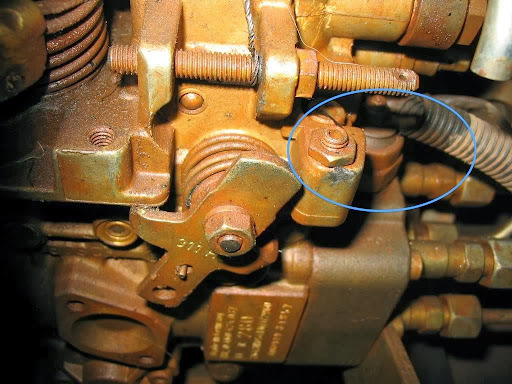 Jumper lead connections may spark a lot and weld themselves together so use a very thick steel bar to absorb the heat and wear glasses (using the solenoid contactor or relay captures any sparking), but the motor should now turn over and start the engine. 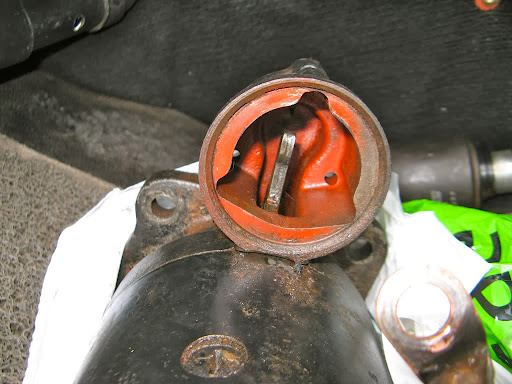 Quickly remove the connection or release the plunger as soon as it starts, and push the rod so the solenoid gear lever moves forward into the housing, disengaging the starter gear. The rod can be tie-wrapped to the motor body so that the gear can't accidentally re-engage. You would need to do this each time you need to start the engine so it's only an emergency fix, so leave the engine running during all short term stops and think about restarting options before switching it off. Doing this is a busy car park or on the road side would be potentially dangerous or frustrating. If all else fails, the Oka can be bumped started quite easily. With a couple of people pushing, the Oka will roll quite well on a hard surface and 5 tonnes of Oka has sufficient energy to turn over the engine, even when moving slowly. I have rarely read or heard of a failed fuel cut off solenoid, whereas broken wires and terminals are commonplace, so check that it really is the solenoid first, before removing it. It should have a low resistance to ground, a few ohms (probably around 10 to 20 Ω, check it by connecting a 5W globe in series to +12v, it should glow if the solenoid coil is OK). If you can hear it click when voltage is applied it's probably OK too. What if the Solenoid has Failed? If the cut off solenoid itself really has failed (other than a broken terminal screw, and you could tape a wire to it to maintain contact), the engine can't start. I did think that removing the solenoid and using a magnetic pick up wand to engage the valve may work. However the solenoid valve also seals the rear injector port so removing it would allow fuel to leak out, probably under pressure, so that trick won't work. 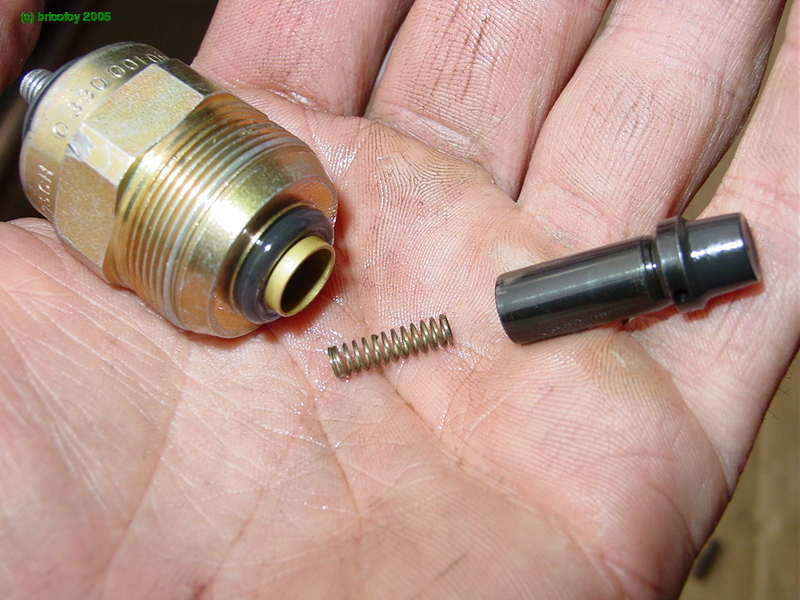 (See this photo of a disassembled solenoid valve and its location). In this case replacement or modification (see below) of the solenoid is the only answer. This is now on my list of "Things To Do If Desperate". "When mine went out two years ago, I gutted it rather than replace it. To do this, remove the solenoid from the VE pump [edit: 15/16 inch spanner] and remove the plunger and the spring from inside the solenoid. Double check in the pump and solenoid that there's no debris and reinstall the solenoid. This will allow the engine to have fuel constantly. It'll operate the same as if you had a working solenoid, the only difference is that in order to shut off the engine, you'll have to manually stall it out. I've been doing this for two years now with no problem." Note, no electrics to the pump are required after this mod and the fuel will be permanently on, which doesn't matter except that the engine won't stop and would have to be stalled. 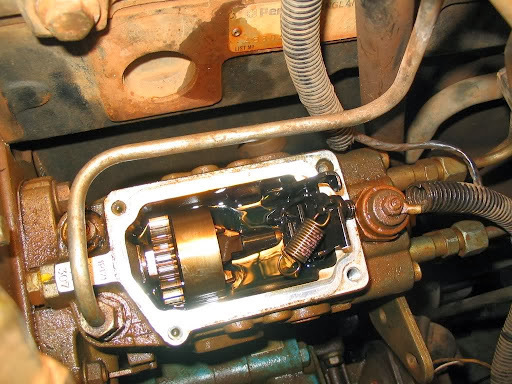 However getting access to the solenoid might require removal or loosening of the top section of the pump, but if you're desperate enough anything goes. [In fact if you can bump start the Oka after parking on an incline (I'm not sure how easy this is with a diesel, try 2nd or 3rd gear), you wouldn't even need any batteries after this mod to the solenoid. Caution, if you ever try this without batteries, disconnect the alternator first to avoid generating high voltages after the engine starts which could damage any electrical equipment. The batteries normally constrain the voltage to around 14v, even dead ones, but an unloaded alternator can generate up to 100v at very high power and can even be used as a welding supply]. 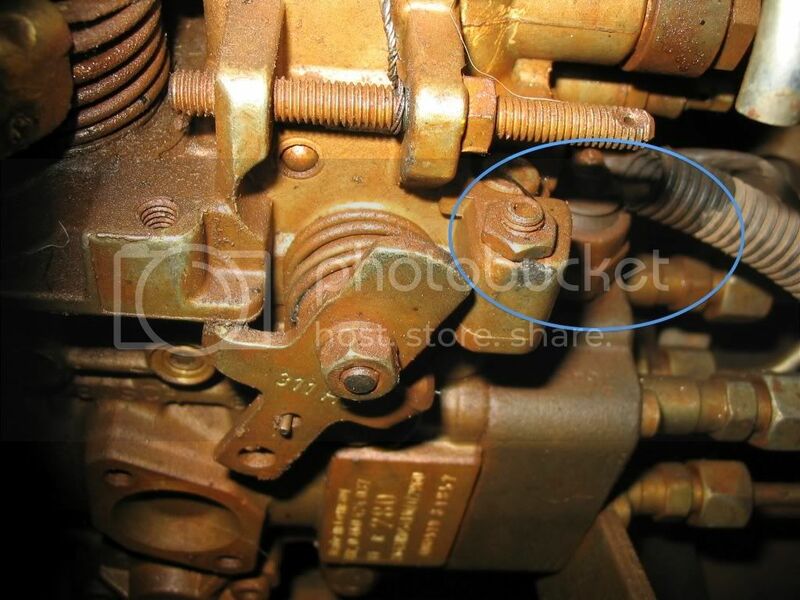 This the solenoid location on our injector pump. It looks inaccessible, but with a 15/16th spanner or shifter it should be possible to remove it. The solenoid is on the right, with the top of the pump removed. It shouldn't be necessary to go this far, I was replacing the throttle shaft seal when this photo was taken.